The US government is holding Chelsea Manning in solitary confinement again. It’s a vindictive, unconscionable attack on a brave truth teller. On June 1, 2013, I joined a thousand people on a march through Fort Meade, Maryland calling for Chelsea Manning’s release. Manning, a former soldier in the US army, was scheduled to be court martialed for passing US war logs and diplomatic cables to WikiLeaks. The collection of documents painted a shocking portrait of US empire and the brutal realities of its wars. At the end of the march, we hung “Nobel Prizes” for Manning on the gates of the military base where she would soon go on trial. The symbolic gesture stemmed from tongue-in-cheek calls for Barack Obama to “give” his Nobel Peace Prize to Chelsea Manning. It nonetheless seemed like a fitting gesture. Manning’s intent was to spark a debate on US foreign policy by exposing its dark truths. Instead she was swept up in a larger Obama-era crackdown on whistleblowers. While the powerful that committed heinous crimes went largely unpunished, those who dared expose them, like Manning, were thrown in jail. Manning had already pled guilty to charges carrying twenty years in prison. It wasn’t enough for prosecutors. The military went ahead with a court martial that alleged she had violated the Espionage Act and aided the enemy. They sought a life sentence. A military judge acquitted Manning of aiding the enemy, but found her guilty under the Espionage Act. She received an unprecedented thirty-five-year prison sentence. Throughout her incarceration, Manning was subjected to harsh conditions, including a pretrial detention that most likely constituted torture and denials of gender-affirming medical treatment. 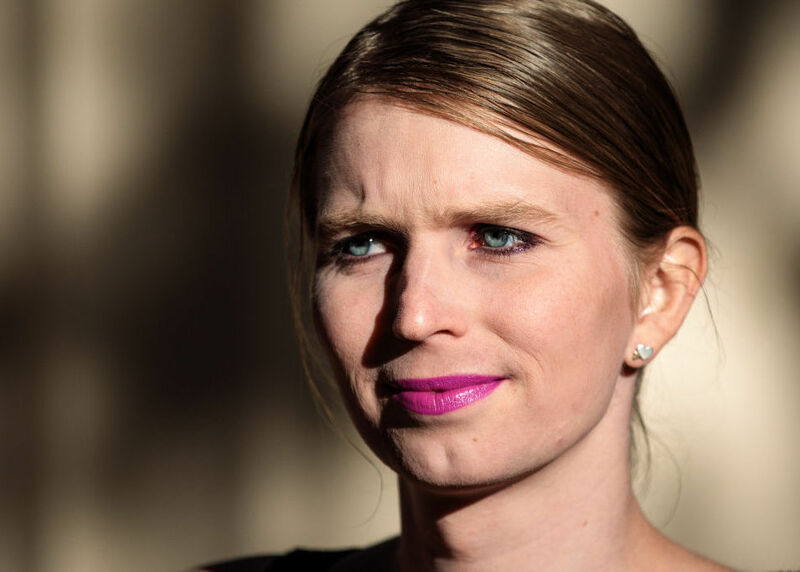 Manning pursued both litigation and a hunger strike to fight for her health rights as a trans woman. While relenting on medical treatment, the military continued to hold Manning in a men’s prison. Just before leaving office, Obama commuted Manning’s sentence in the face of significant popular pressure (though not before she served seven years in prison — the longest anyone has ever served in the US for disclosing classified information to the media). Yet now, Manning is again behind bars. And she’s being held in solitary confinement. Earlier this month, Manning was subpoenaed by a grand jury and refused to testify about her earlier public disclosures of classified information. As Manning and her attorneys pointed out, “Manning herself gave robust testimony about her own relationship to the 2010 public disclosures during her court martial proceeding.” It’s not clear what new evidence she could offer. Manning’s attorneys have argued that the subpoena is possibly retaliation for her release. It’s no secret that many in the national security establishment resented her release. And Donald Trump himself tweeted condemnations of Obama’s decision. Tellingly, a US attorney was also present for a hearing on Manning’s subpoena. A judge has ordered that Manning be incarcerated until she testifies or for the duration of the grand jury (which could last eighteen months). Since March 8, she has been held in “administrative segregation.” According to supporters, she is kept in her cell for twenty-two hours, is allowed out only between 1 AM and 3 AM, and has been denied access to the law library and reading materials. In spite of the detention center’s claims to the contrary, this is solitary confinement. According to the United Nations special rapporteur on torture, solitary confinement for fifteen days or more constitutes cruel, inhuman, or degrading treatment. Depending on the severity of the pain and suffering inflicted, it can amount to torture. Manning’s current conditions of confinement would be perilous to anyone. But to subject a torture survivor to further inhumane treatment is unconscionable. It’s hard to view this as anything other than a vindictive vendetta — a brazen attack on a brave truth teller. In order to understand why Manning’s actions have been inspiring to so many, it’s important to understand what she leaked in 2010 and why she leaked it. The media hasn’t been helpful in this respect. For the right-wing media, Manning’s actions were simply treasonous. For the mainstream media, Manning’s disclosures were the misguided actions of a malcontent. Either way, putting the trove of documents into the public record was an act of recklessness — not a public service. But what Manning leaked offered extraordinary insights into how US empire operates. And far from being an indiscriminate leaker, Manning’s goal was to provide the public with information about precisely that. Protracted military occupations are violent, brutal affairs. They require dehumanizing the occupied. Manning, by all accounts, failed to succumb to this dehumanization. She continued to view Iraqis as humans whose lives were of equal worth to their American occupiers. Manning believed that if Americans knew about the violence inherent in US war-making, things would change. She thought that by leaking the information, she would be “removing the fog of war and revealing the true nature of twenty-first century asymmetric warfare” — and spark a public debate. The war logs Manning had access to, both from the Iraq and Afghan conflicts, were grim: civilian causalities, torture of detainees by Iraqi police, contractors killing civilians, foreign support for the Taliban. The most harrowing part of Manning’s leak was a video of a July 12, 2007 airstrike in Baghdad. Released by WikiLeaks under the provocative title “Collateral Murder” and filmed from the vantage point of a US helicopter, it shows two US apache helicopters firing at Iraqis on the ground. After the initial strike, a van drives up to assist the wounded. The helicopters again open fire. Unbeknownst to those in the air, two children are in the van. When US soldiers arrive, they can be seen trying to pull the wounded children out of the van. Finally, the video shows US helicopters launching hellfire missiles into a building. Reportedly, the US soldiers had been hit by rocket-propelled grenades earlier in the day. While some of the Iraqis in the video do appear to be armed, there is nothing in the video to suggest that any sort of firefight took place. Amongst the dead were two Reuters war correspondents. Ethan McCord was one of the three soldiers that could be seen rescuing the children. In the aftermath of the video’s release, McCord spoke publicly about “Collateral Murder.” The violence of the occupation led him to turn against the war. The video’s contents, he said, were less an anomaly than an everyday reality of occupied Iraq. Collateral Murder gave us a glimpse into that gruesome world — one most of us would have never see otherwise. In addition to the Iraq and Afghan war logs, Manning released a mass of US diplomatic cables. Critics of Manning usually hone in on these disclosures to disparage her status as a whistleblower. They undermined US diplomacy, critics charge — they were too large, too sprawling to justify being released in bulk. But the State Department logs revealed just as much about the inner workings of US empire as the war logs did. They showed that the US had helped American clothing companies pressure Haiti not to raise its minimum wage. They exposed a secret agreement between the US and Yemen, whereby the US would surreptitiously bomb the desperately poor Arab country and the Yemeni government would claim the shellings as their own. Cables demonstrated the US was supporting the Venezuelan opposition. And a series of cables documenting corruption by the Tunisian government inspired protests that eventually toppled that regime. While it is important not to reduce a complex series of events like the “Arab Spring” to a single factor, the efflorescence of protest that followed the disclosure confirms the public service Manning rendered. Manning viewed these cables as “crazy, almost criminal political backdealings” that showed how “first-world countries exploited third-world countries.” Certainly, aggressive militarism is one way the US maintains global hegemony. But the US does not rule through military force alone. Manning not only removed the fog of war, she unraveled the ideological trappings that obscure how US foreign policy really functions. What’s heroic about refusing to testify before a grand jury? Grand juries are secretive affairs. The public is barred from knowing what takes place, and individuals hauled before them aren’t even allowed to have attorneys present. Manning wasn’t told what the grand jury was investigating, and a hearing in which she raised objections to being forced to testify occurred in secret. Manning’s reservations are well founded. While the grand jury’s target may be officially a secret, anonymous officials confirmed to the Washington Post that the inquiry was related to a secret indictment against WikiLeaks founder Julian Assange. Press freedom groups have long warned about the ramifications of the US government pursuing charges against Assange for publishing the information that Manning leaked. Regardless of what one thinks of Assange, such a move would be an unprecedented blow to press freedom. No one has ever been prosecuted in the US for publishing classified information, in part because most assume it would be unconstitutional. Even the Obama administration — which essentially normalized the practice of charging whistleblowers under the Espionage Act — balked at prosecuting Assange or WikiLeaks as a bridge too far. As the New York Times general counsel warned, any precedent allowing the government to prosecute Assange for publishing classified information would make it easier to come after papers like the New York Times. While the Obama Administration realized there was no way to go after Assange without unraveling press freedom, the Trump administration has no such compunctions. Trump has repeatedly demonstrated his intolerance for internal dissent and hatred of the First Amendment. And in spite of a much-hyped rift with the intelligence community, given that he shares their anti-democratic impulses, they are much more likely to have his ear. Manning’s attorneys also believes their client is being set up. Manning testified at length, but believes she nonetheless did not confirm the narrative the government wanted her to. This is most likely a reference to Manning’s assertion that she acted independently in leaking the information and was not solicited to do so. If Assange had solicited the leak, as opposed to merely publishing the documents, there would be fewer hurdles to prosecuting him. The government could also be hoping Manning will make inconsistent statements, exposing her to a perjury prosecution while also undermining her credibility as a potential defense witness. Prosecutors indicated that they believe Manning has made statements inconsistent with her prior testimony. But Manning has never spoken publicly about the disclosures. What statements could the prosecution be referring to? Manning’s attorneys presented the court with evidence that Manning has been subjected to potentially illegal surveillance, as well as surveillance by non-state third party actors. While Manning maintains she testified truthfully, her attorneys have suggested that this may explain the prosecution’s comments. The situation is extremely dangerous. The national security state, with Trump at the helm, has a rare opportunity to get something they’ve long coveted — prosecution of publishers — but always been denied. And further punish a vocal critic of US foreign policy. Sycophants of the national security state treat the keeping of its secrets as an almost sacred act. But what are these secrets that are so precious? That US foreign policy is conducted to advance the interests of the powerful at the expense of ordinary people? Chelsea Manning thought the American people had a right to know what its government does. She thought that exposing the realities of war would trigger a debate about US foreign policy. The attempts to silence her are about preventing those debates, and the grand jury subpoena is an escalation of that attack. From disclosing US secrets to resisting the grand jury, Manning has led a courageous fight to defend the public’s right to know. By placing Manning back in solitary confinement, the US government has demonstrated how far it’s willing to go to punish those who shine a spotlight on its crimes.